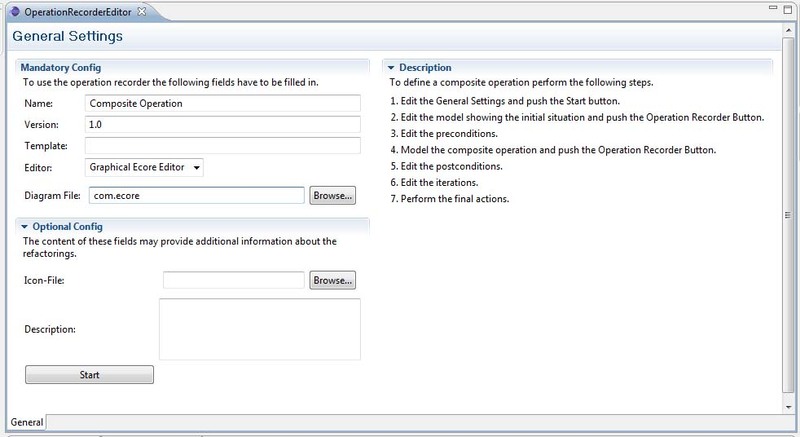 The Operation Recorder allows to specify of composite operations like refactorings for Ecore-based models by example. The user simply illustrates the refactoring by applying it to an example model within his/her preferred modeling editor. Therefrom, the Operation Recorder automatically derives a generic operation specification, which may then be manually fine-tuned. There is also a screencast of the operation recorder in action available. The user starts the specification process by providing the initial model. This model contains all model elements which are necessary to successfully apply the composite operation. 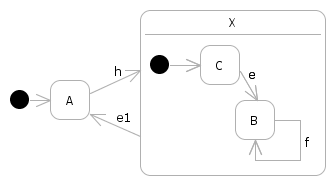 Each model element of the initial model is annotated with a unique ID. In the next step, a so-called working copy is created automatically, which is a copy of the initial model. The user applies all necessary changes of the refactoring to the working copy. The result is the so-called revised model. 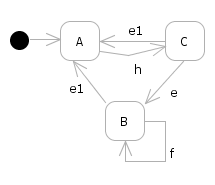 The IDs preserve the relationship between the model elements in the initial model and the changed elements in the revised model. Both models are the input for the second phase of the operation specification process. When the revised model is completed, the Operation Recorder detects all performed atomic changes by conducting a state-based comparison relying on a sound ID-based match. Furthermore, the Operation Recorder derives pre- and postconditions necessary for the application of the composite operation. Then, the user may edit those automatically derived conditions. In particular, the conditions may be activated, deactivated, or modified. Furthermore, additional conditions, iterations, and user input variables may be introduced by the user. In the last step, the operation specification is automatically generated created. Such operation specifications may now be automatically applied to arbitrary models, which fulfil the preconditions. 2.) Any editors may now be used for changing the initial and the revised model. 3.) Lists containing the automatically derived pre- and postconditions. In this view, the conditions may also be edited. 4.) The final page showing the differences and allowing to introduce iterations and user input variables. 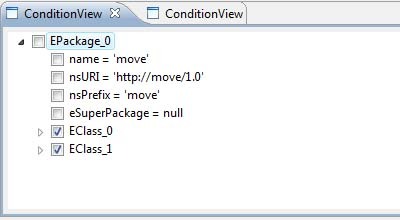 So far, we successfully designed the following refactorings using the Operation Recorder. Description: Move an attribute of one class to an other class. Description: Introduces a static method which creates one instance of a class if the instance does not exist or which otherwise returns one instance. Constructors are set to private. Description: Sets a public variable to private and adds a getter and a setter method. Description: Removes one attribute from a class. For this attribute a new class is introduced and related the new class is related to the other class. 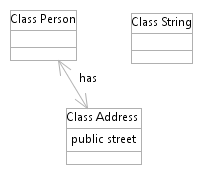 Description: Attributes and Methods which are shared by multiple classes are extracted in one common superclass. Description: States with the same transitions are grouped in one composite state. Description: Adjacent states are merged to one state. P. Brosch, P. Langer, M. Seidl, M. Wimmer, Towards End-User Adaptable Model Versioning: The By-Example Operation Recorder, in Proceedings of the International Workshop on Comparison and Versioning of Software Models (CVSM'09) co-located with the 31th International Conference on Software Engineering (ICSE'09), IEEE, pp. 55-60, 2009. "The Operation Recorder: Specifying Model Refactorings By-Example ,"
in Companion to the 24th Annual ACM SIGPLAN Conference on Object-Oriented Programming, Systems, Languages, and Applications, OOPSLA 2009, ACM, pp. 791-792, 2009. "An Example Is Worth a Thousand Words: Composite Operation Modeling By-Example ,"
in Proceedings of the 12th International Conference on Model Driven Engineering Languages and Systems (MoDELS'09), Springer, pp. 271-285, 2009.